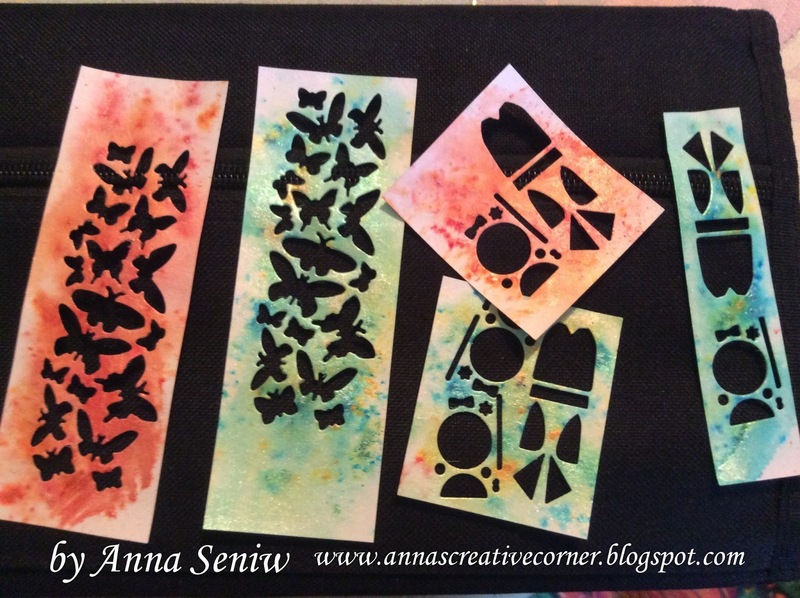 I've been having a ball with Tim Holtz's "Crazy Dogs" stamps and dies!!! I had several different occasions to make cards; birthday, graduation, congratulations and even thank you and these fun dogs fit the bill for ALL of them! As you can see, the layout is the same for all of the cards. I layered the pencil colored dogs on a piece of card stock that was embossed with the appropriate saying for the card. Added some extras and most importantly added the sunglasses!!! And don't forget to add glossy accents to the lenses to make them look shiny and like real lenses! Hope you're having a great day and finding some time to craft!!! I have been having a ball with these new dies from Frantic Stamper called, Kokeshi Japanese Paper Dolls die set. They are just so cute!!! And what's neat is that you can cut out 6 different hair styles with ONE pass of your die cutting machine! I do wish it had more "body" dies, but I did get around that. Since the die is not detailed at all, I ran two pieces of card stock with the die and therefore got double the amount of base bodies as opposed to only using one piece of card stock. And here are a bunch of dolls that I just put together. I had so much fun watching them "grow" and choosing the varies hair styles as well as the different color kimonos. With these dolls, I will be ready to put a card together in just about no time. And let me show you what the background card stock looks like when I cut out all the pieces. I used Cosmic Shimmer Pixie Powders to create the backgrounds. 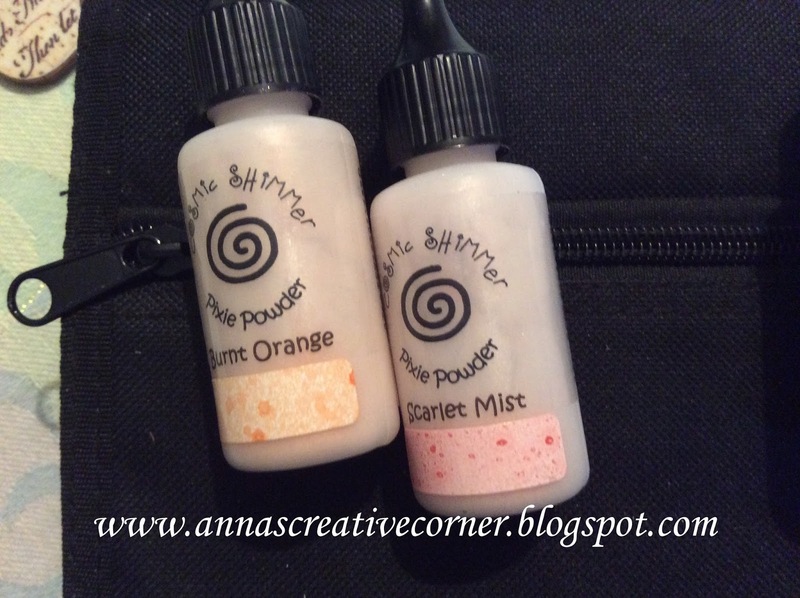 It is very simple to use these powders; just sprinkle on the card stock and mist it with water. The result is a beautiful shimmery watercolor background! The MICA is these powders is what gives it the shimmery shine which is perfect for this project making the kimonos look like real satin! 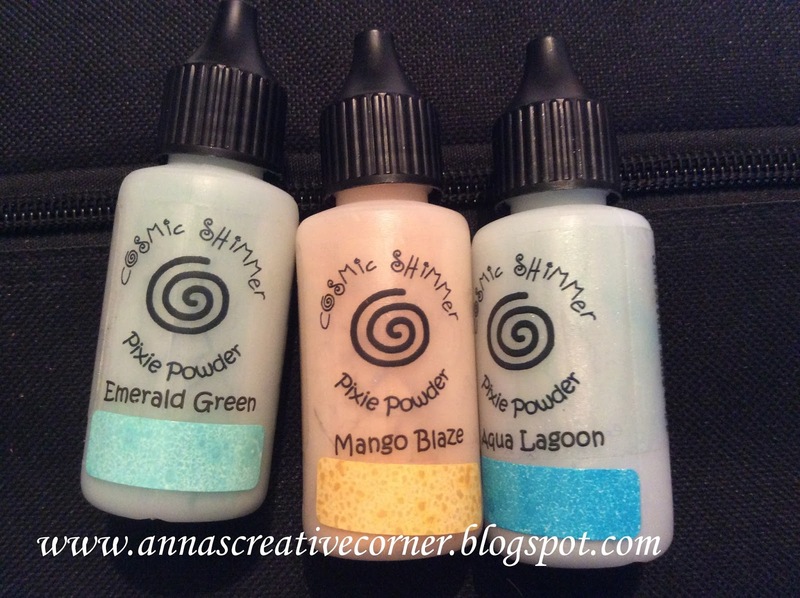 Hope you get inspired and start playing with these Pixie Powders. I received Carol's Valentine card the other day and I was totally blown away with it!!! I just LOVED the color and I NEVER would have thought to use this color combo for Valentine's Day. I've used the traditional red or pink, and even red, white and black, but this idea of teal just was totally out of the box and again, I just loved it! It also is a very simple design and you can create multiples of it. I have emailed Carol to tell her that this card was out of this world and she was the usual Carol. I know she loves easy, not many layers and nothing that is messy! She shared with me that she wanted to GET RID OF HER SCRAPS, and so she used up her scraps!!! She ended up with many cards and in many colors. I should have asked her, how did she know I love teal blue??? I want to thank the wonderful ladies for coming out to my class yesterday. We had a very fun and productive afternoon! The following is the third card that we made in class. The scribbled roses are so popular and made by many companies now. When I first saw them, I thought they were just ok. Then I started seeing samples all over Pinterest and they started to grow on me to the point where I ordered the set from the Frantic Stamper and had to try them out. I've also noticed that the color combo of gold, black and white is very popular now and so I tried it out. When I think of these colors, I think of an elegant evening dress and I think it came across in this design. Here are some pictures of the ladies working diligently on their works of art. You can almost see the smoke coming out of their brains! But believe me, we also had quite a few laughs during the afternoon! I also want to take the time and thank Ginny for helping with the cutting for the class. She cut all the black roses! Thanks again Ginny! You saved me so much time!!! And here is a picture of all three cards that were made in class! Hope you're having a fabulous day and I look forward to seeing you in my next class! Today I have a poinsettia card to share with you. It's a simple design, yet with the sparkle of the stickles, it makes a pretty Christmas card.